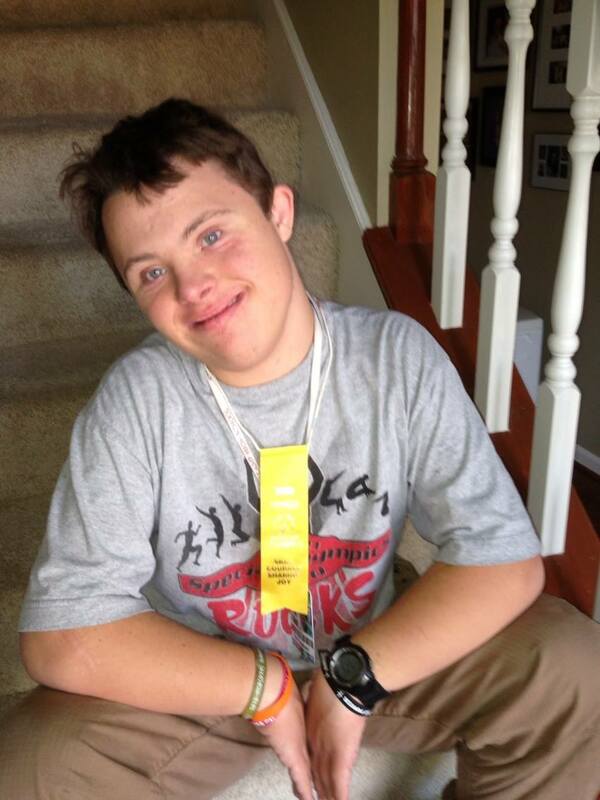 A few years ago, after watching his mom receive several Mother’s Day cards (one of which he made himself), and what seemed like an extraordinary amount of attention and love being directed toward her, my son, Matt, asked: “When is ‘Brother’s Day? '” Of course his two sisters, and mother, and I all looked at each other and giggled, and wondered why we had never thought of that? In mid January, Matt’s sister, Kerra, called to say she had ordered a T-Shirt she was going to surprise him with on a weekend visit in February. The week before Valentines Day, Matt got off the bus and asked if his CD was in the mail. I had no idea that any CD had been ordered, but got to thinking if Valentines Day was only a few days away he had good reason to be hopeful. “Has the mail come?” was how he started the conversation, and then he said something about “Kenny Chesney…the road and the radio.” He quite often makes up titles of CD compilations that don’t even exist with the sheer hope that him giving it a name will make it a reality. When we bought Brad Paisley’s “Wheelhouse” as soon as it was available, within a week he asked for “Wheelhouse Live.” I later found out there really was a “The Road and the Radio” by Kenny Chesney. He had asked his mom to “order it” – his words – and so he actually knew what he was talking about. But before I knew all this, and just to humor him and get him to stop talking about it, instead of walking into the house I told him, “Let’s go check the mailbox,” because I knew there wasn’t going to be anything except mostly junk mail in that day’s delivery. I think “Brother’s Day” was meant to happen on February 21-22 this year. It will begin around 11:30pm the night of the 21st, when sister Kerra, brother-in-law Brett, and “dog niece” Lucy arrive and Matt finally gets to open the package. 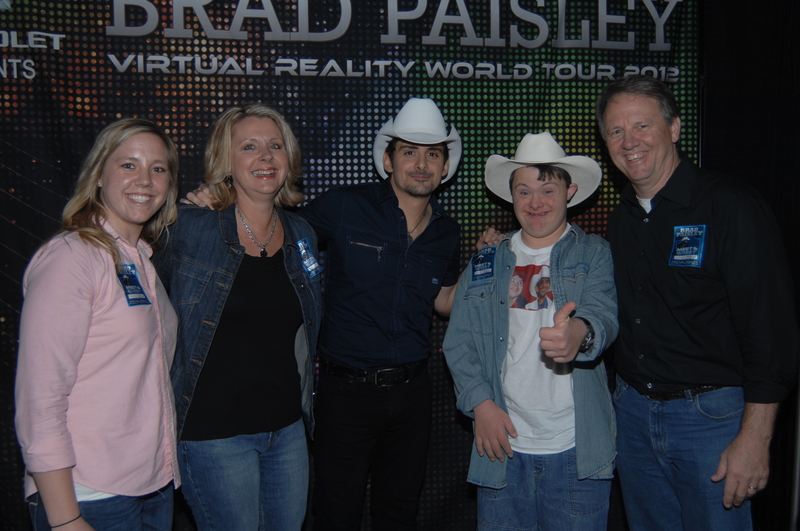 This was Matt’s first concert – Brad Paisley in Knoxville, TN, in March 2012. Two wonderful friends arranged an after-concert backstage visit with Brad and it was a real treat for Matt and us too. Brad was an exceptionally kind and gracious “star.” Matt is wearing an autographed shirt that Brad had sent to him when he heard he had such a big fan at Station Camp High School. I don’t know if “Brother’s Day” will ever get enough traction to become a national holiday. If it does, please remember it was Matt that started it! This blog was written on June 23, 2013. I felt like there was something “unfinished” about it, and so I never posted it. Little did I know that the “unfinished” part had little to do with the writing, and ALL to do with the fact that (unknown to me in the summer of 2013) the story was not yet over. I would like to think I am not star-struck. Here are some “famous” people I have met. When I was maybe eight or nine my dad was instrumental in organizing a telethon for Cerebral Palsy that was produced in Nashville, and I went with him to the airport to pick up Jayne Mansfield and Ed Ames (Mingo on “Daniel Boone” at the time). To show how young I was, I was a whole lot more excited about being in the car with “Mingo” than I was being in the car with a glamorous movie star! When I was in fifth grade I played guitar and sang “Green, Green,” on my elementary school stage at a talent show, and Nashville session picker, Harold Bradley, played backup for me. 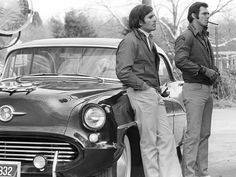 While in high school I watched a scene from a Burt Reynolds movie being filmed in Nashville (my cousin was a stunt double and stand in for Reynolds), and I met Burt. During my few years in the music and publishing business I worked with Bill and Gloria Gaither, B. J. Thomas (Raindrops Keep Falling on my Head), Jeannie C. Riley (Harper Valley PTA), legendary football quarterbacks Terry Bradshaw and Roger Staubach, and I was invited to the White House for an “All Day Singing and Dinner on the Grounds” with President Jimmy Carter and met him and Rosalyn. I palled around with com edian Jerry Lewis for about three days while he was acting in a commercial that was being filmed at a sound stage I worked at in Dallas, Texas. I worked on an Amy Grant music video. I was on the production crew and the scene (Angels Watching Over Me) involved her almost being run over by a car. The “prop” car was a 1957 Chevy Bel Air and it was a straight shift. I was the only one on the set that knew how to drive a straight shift so I was tagged with the task of trying to run over Amy Grant (look for the video on Youtube). When my wife, Leann, was singing backup for Opry Star, “Whisperin’ Bill Anderson,” I sat by Reba McIntyre (before she was particularly famous) on the stage watching the Opry, and had a nice conversation with an “up and comer.” I was in a couple of charitable organization committee meetings with Minnie Pearl. I sat by Michael Johnson (Bluer than Blue) at the Nashville Symphony one night. Of all of those people – some of them famous in their particular context, but some of them internationally famous – I think the only autograph I have is Roger Staubach’s. His autograph is inside a book that he wrote which was published back in the early 1980’s. I was given thirty minutes in his office to meet with him and interview him for a radio show. The producer and I talked about what “amateurs” we would come off as if we asked for an autograph when we got through with the interview. I told the producer I didn’t give a flip. Staubach was my boyhood hero of my favorite pro football team and I wasn’t ever going to see him again anyway! There are two other famous people I have met, and those were both because of Matt. Legendary Alabama Crimson Tide football coach, Gene Stallings, and Brad Paisley. 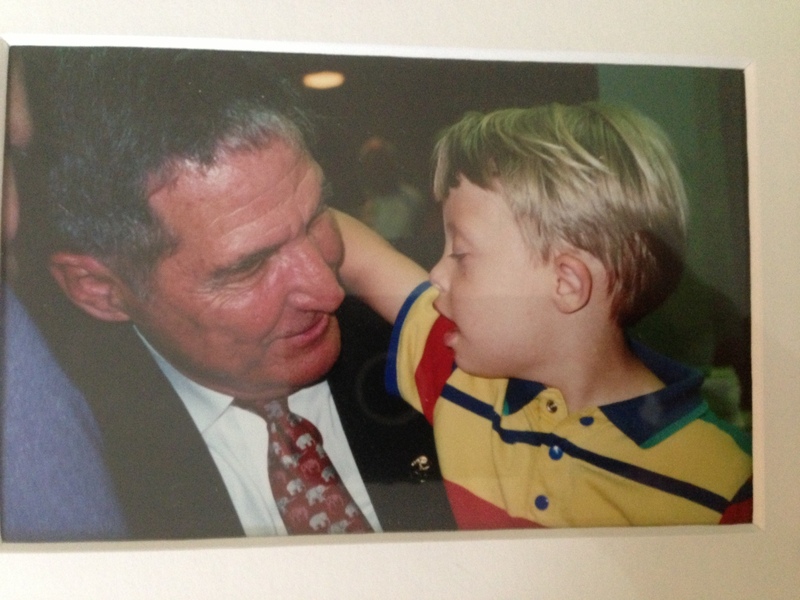 Leann and I took Matt to a local speaking engagement of Coach Stallings, and our copy of the book he had written about his son, Johnny, also with Down syndrome. Matt was probably three years old. We hoped to get Coach Stallings to sign the book and sure enough, after the presentation they had a book signing. We stood in line and when we got in front of Coach Stallings he looked up, took one look at Matt, put his Sharpie down and reached for our sweet son. Coach Stallings acted like the other fifty people behind us weren’t even there, and took very special time talking to Leann and I and encouraging us. I’ve never been much of an Alabama Crimson Tide fan. But that encounter changed all that! 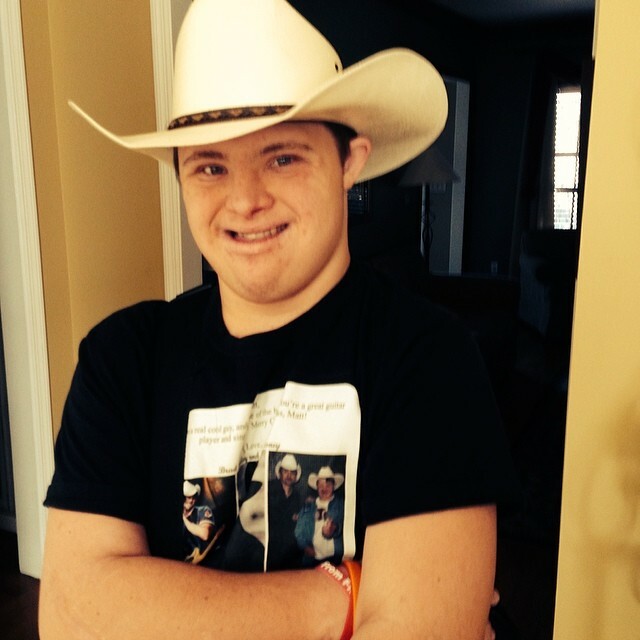 A couple year s ago we were able to get tickets to a Brad Paisley concert – Matt had talked non-stop about him for a year or two before that. Matt knew practically every word to every song that Brad sang. A friend arranged to get us backstage after the show and we got to spend about ten minutes with a super star. Brad’s person had put us at the end of the line on purpose. We had to wait a while to see him, but once we got there no one else was behind us waiting to see him so we had a wonderful, comfortable, casual visit. 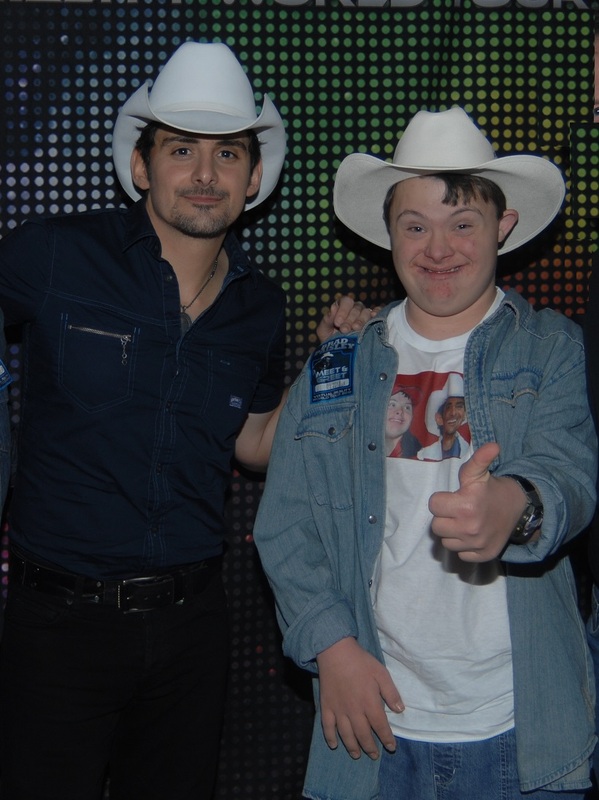 It is to that Brad Paisley experience with Matt that I can credit getting a “picture with…” of my own (Hey! If he’s brave enough to do it can’t I? 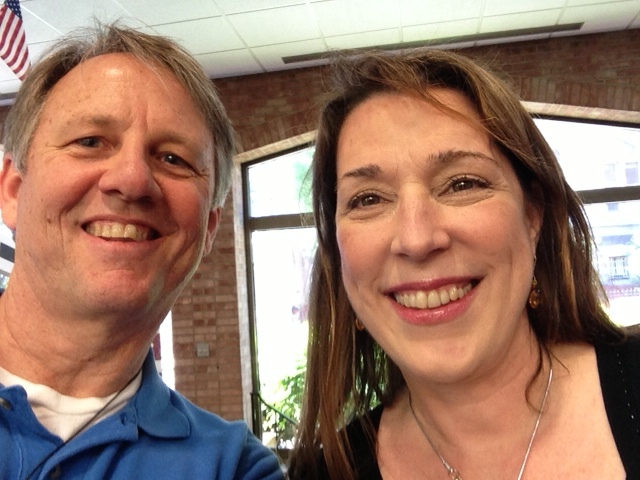 ), and, at the same time, marking something off my bucket list – getting to meet an amazing writer, picker, and performer. There are really just a few “famous” people that, if given the opportunity, I would be thrilled to have an hour or two in their presence. One of those people is Nashville singer/songwriter Beth Nielsen Chapman. I have been listening to her music for about twenty years. You may have never heard her sing, and you may have never heard of her. But I bet you have heard one or more of the songs she has written: Martina McBride’s “Happy Girl,” and if you haven’t heard Faith Hill’s “This Kiss” you have been under a rock somewhere! What has always moved me about Beth’s writing is that she is not afraid to write truthfully out of challenging circumstances in her own life. She writes about faith, hope, and love, by speaking the truth to doubt, disappointment and loss. Out of her powerful lyrics and beautiful melodies come a more relevant story for many of us whose lives have been full of surprises – some of them disappointing and difficult. It seems that across the past twenty years every time I was struggling with something going on around me I have discovered some CD of Beth’s that I had not heard before and as soon as I listened to it there was a song whose words and melody spoke deeply and truthfully to me. (If you don’t believe me try the CD’s “Sand and Water” and “Back to Love” and if you are not deeply moved by at least one song on each CD….well, you just have a heart of stone!). Beth Nielsen Chapman is one of those artists who is in Nashville on a pretty regular basis singing for a “writer’s night,” or some concert raising funds for something. So it is not like she’s not accessible, but it seems that every time I have been aware of her singing live somewhere I find out about it too late to get tickets, or they are too expensive, or I’m booked doing something of my own. For years I have wanted the opportunity to meet her and be able to tell her what her music has meant to me. This past May (2013) I attended a continuing education event for preachers: “The Festival of Homiletics.” In addition to preachers, theologians and other experts in the field of preaching lecturing and delivering sermons, there was a concert to open the event. Beth Nielsen Chapman and Ashley Cleveland (another Nashville singer/songwriter) were the artists who would perform. After the concert, a worship service, and a lecture, Beth and Ashley were hanging out selling their CD’s. If you remember my long list of famous people and my short list of autographs, you might figure I just don’t care about autographs. While I don’t particularly place a huge significance on them, the main reason I don’t have more is just that notion to not want to “bother” people that I know get asked all the time – get interrupted in the middle of dinner – and who get put on the spot in public because they are famous. With Beth Nielsen Chapman it wasn’t so much the autograph, as it was the opportunity to have even a brief conversation with her. I bought four CD’s that I already had and asked her to autograph them…only so I could have an extra ten seconds to tell her, “Thank you! Thank you! Thank you!.” And I did. Over the next few days (of the Festival of Homiletics), Beth and Ashley would sing a song or two for the small-group-breakout sessions and be present to sell their CD’s and so I happened upon Beth’s CD table at a time when most people were in sessions and so it was slow and I didn’t feel too “imposing” to ask if she would mind taking a “selfie” with me (mostly so I could prove to my wife and daughter’s that I actually met my hero!). She was kind enough to let me get our photo together. I was not at all surprised. But I think I must admit, after all, I really am just a bit star-struck! If you go back and look at my (Facebook) timeline it is only occasionally that I have much to say. I hope that is because every week I spend lots of hours listening, reflecting and unpacking what I think God wants me to say in a few minutes on Sunday morning to those good people who have made the effort to come listen. My Lindsay, who will celebrate her 22nd Birthday next week, has discovered something every pastor wishes every person that ever asked: “Where is God” would discover….and believe….and hold on to when it just seems like there is nothing else to hold on to. So thank you Lindsay for giving me something to share that you said worth saying today and everyday on Facebook and everywhere else in the world. I love you!